First things first... Was getting that very bright room dark. 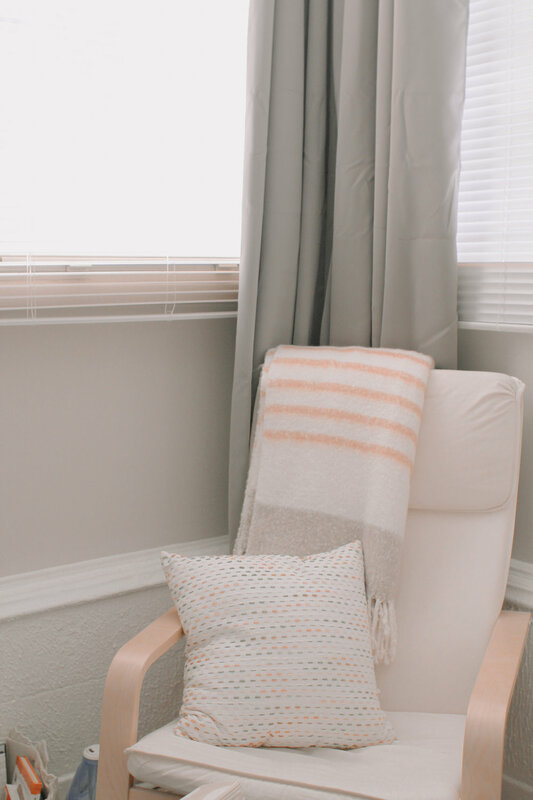 We added the cheapest blackout curtains I could find since we needed four panels ($$$$$) & added bamboo blinds to the indoor windows, including the windowed door. The adjustment to the lighting also required moving some of the plants, SPECIFICALLY the fiddle fig, who I'm happy to report, is still alive & très happy in our bedroom. Also peeking out there by the chair is the humidifier we added. Our apartment has radiator heat, so it's pretty constantly dry dry dry all winter. Gotta keep that baby's lungs & skin happy! Now that we're getting back into cold weather, after a summer of newborn snuggles in DC's disgusting heat & humidity, it quickly became apparent that I did not have enough room in my closet to share with Crew's growing cold weather wardrobe. Knowing that I needed his third layer pieces to be easily accessible as we get out the door & that I typically change him right before we leave, I wanted his clothes as close to the changing table as possible. We didn't have great options for a spot to put a hanging rod or free-standing clothing rack, so we went with a more retail look. We picked up the hooks & hangers from Ikea, & spray painted the hooks gold & the hanger metal white. Probably $15 total, since we already had the spray paint. I actually really love this concept more now that it's up - It keeps me shopping for clothes within his capsule wardrobe's aesthetic while also keeping me from shopping too much without getting rid of something else, since space is limited. Win win! Crew would probably be sleeping in our bedroom until he was 10 if it weren't for our video monitor giving us the peace of mind we needed to move him out. The Lollipop Baby Cam was everything we were looking for in a baby monitor - Pristine imaging (including the night vision), video monitoring via our phones, multi-user/invite only access, a secure monitoring network, baby crying notifications, background audio (for when you want to have another app open), white noise/classical music capabilities, built-in microphone, event playback... I could go on & on. Their customer service has been wonderful & the only glitches we've run into have been due to our wifi/apartment walls, not the camera itself. I guess the downfall being not having a monitor that doesn't rely on wifi but the other wifi driven capabilities far outweigh that. We'll be mounting the Lollipop to the wall with the very cute white branch mount that comes with the camera once Crew can grab it, but so far, he hasn't figured out that he can sit OR stand up in his crib. Fine by meeee. 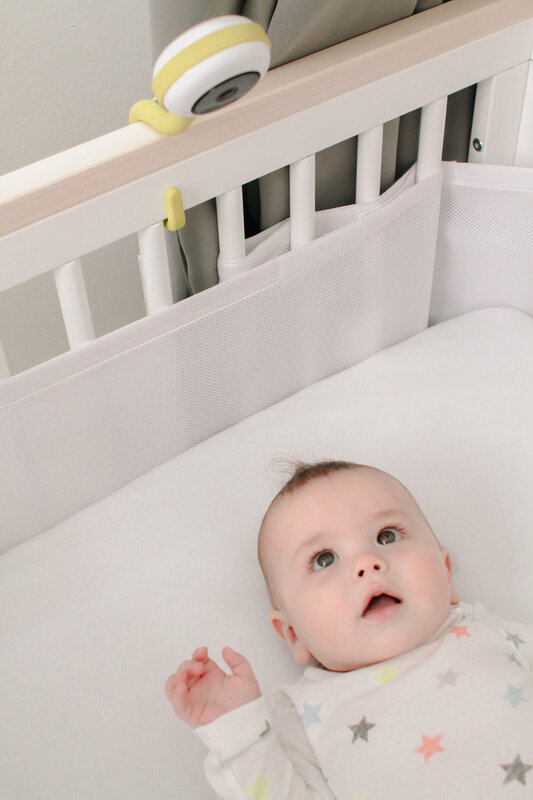 Our only other additions have been adding a blue tooth speaker that syncs to our ipad for white noise at night, classical music during daytime naps (again, our wifi isn't reliable enough to have consistent white noise run on the video camera), & our mesh crib liner. (I know this is a topic of debate, so just know that this was the right decision for us & we only advocate doing your own research. YOU DO YOU.) Obviously, we've also removed all the pretty in-crib decor now that he's in there for something like 16 hours a day. Lastly, you'll be glad to know that my little nursing corner is getting all sorts of use these days! I think that about wraps things up! Sources for our updates below. Lollipop Baby Cam is a company that we’ve had the honor to partner with in exchange for a product review. Thoughts & opinions on this product are ours. We 100% stand behind the quality & use of this product, unless otherwise noted in blog post review.